Kids love parties where they can create something of their very own - so why not combine that with party food and have the kids make their own dessert or meal? 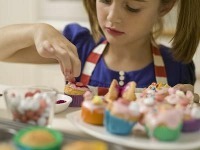 Pizza making parties, dessert making parties and learn to cook parties, they're all loads of fun for kids of all ages. Your little chef will love the cooking parties in NY featured on this helpful resource. See this list of fun learn to cook parties in NY and choose one to throw for your child's next birthday. For your little chef, a cooking class party NY can offer will be the perfect choice.